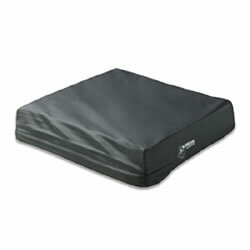 The ROHO® Heavy Duty Cover cover will help protect the cushion from rugged use and every-day wear and tear. It is also ideal for protection against incontinence with its fluid-resistant material and durable construction. The Heavy Duty Cover design allows for easy access to ROHO cushion valves and the ISOFLO Memory Control® on SELECT Series cushions with a double pull zipper. Sizes available to fit most ROHO cushion models. Cover is machine washable. 6 Month Limited Warranty.